New Model Home Open at Jefferson Forest! Fieldgate is very excited to announce that our new model home at Jefferson Forest in Richmond Hill is now open to the public! The new model is called The Fir, and it’s a beautiful 2,200 square foot end-unit. We had people lining up an hour early this morning for the 11 am opening, and now the home is bustling! Everyone is admiring the incredible features and finishes, like the natural oak strip hardwood flooring, the tall upper kitchen cabinets, the sleek granite countertops, and the gas fireplace with a white painted mantel and marble facing. If you’ve been looking for a new home in Richmond Hill, odds are you’ve heard of our Jefferson Forest community before. This is your chance to get a feel for what life at Jefferson Forest would be like! We also have other models for you to check out while you’re here. 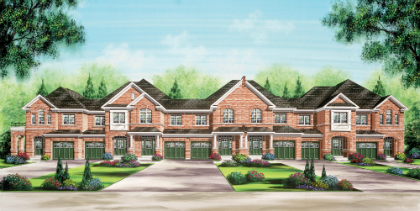 Our model homes are located at 73 Paper Mills Crescent, which is northwest of Yonge Street and Jefferson Forest Drive. The Fir will be open for viewing until 6 pm today. If you can’t make it out this afternoon, we’re open from 11 am to 6 pm on Sunday.